Former KCD student Evan Blum and his wife Vanessa Richmond were our special musical guests on Friday, January 18. 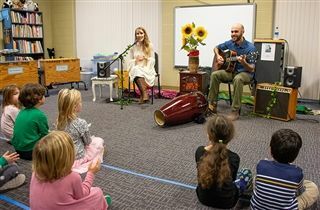 The duo, who record and perform children’s music as Evan and Vanessa, performed a number of charming songs for JK and kindergarten music classes. Thanks to Evan and Vanessa for playing for us—our students loved the performance!